Can I be Charged With OUI Drugs in Massachusetts if I Took a Prescribed Medication? An OUI Drugs charge in Massachusetts can arise even if you took a medication prescribed by a doctor. This may seem surprising at first, but there are in fact two circumstances by which you could indeed be charged even if your “drug” was prescribed to you. 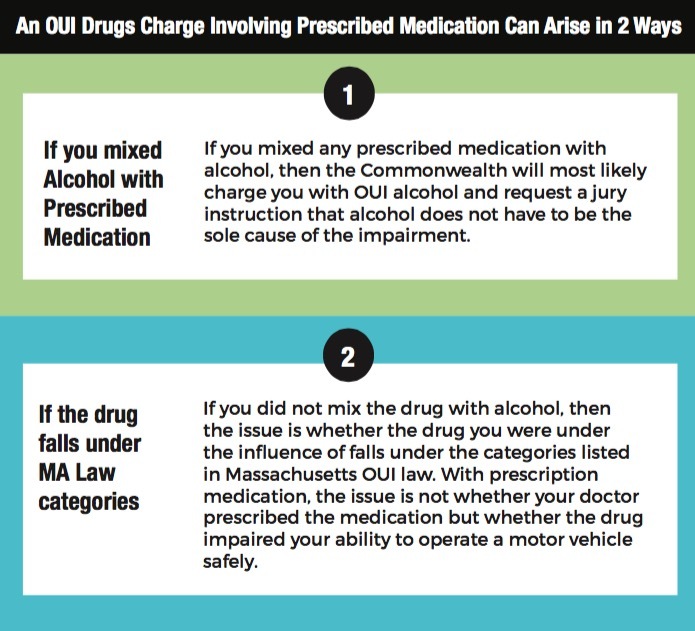 There are several important defenses to prescription drugs OUI cases. First, if the drug is taken as prescribed, and your doctor has been given the medication, it may be difficult for the Commonwealth to prove that the drug impaired your ability to drive. For example, your doctor would know that you are taking the drug, driving to appointments, and if no specific restriction was placed on driving, it is unlikely the drug would impair you. An officer making an arrest for OUI drugs in Massachusetts would need to know the dosage of the drug you took, as well as when you took it, to form an opinion as to impairment. Most prescription drugs fall within a class of Drugs known as Narcotics Analegics. Narcotic analgesic is an opioid medication used to treat moderate to severe pain. These drugs include Percocet, Vicodin, Methadone, Fentanyl, and Oxycodone. Other types of prescription drugs may be depressants; these are typically anti-anxiety medications like, Xanax, Klonopin, and Diazepam. 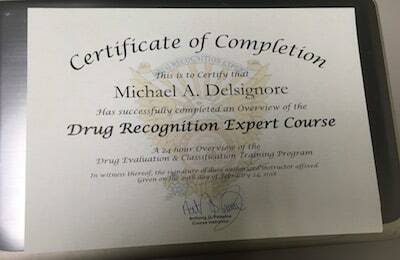 Attorney DelSignore recently attended a Seminar in Georgia, which covered topics ranging from how DRE officers are training at the police academy, as well as strategies to cross-examine the officers in court. In cases involving the first circumstance listed above- where it is alleged that alcohol was mixed with a drug- the Commonwealth may seek a jury instruction under a case called Commonwealth v. Stathopoulos. In cases where a defendant’s breath test is below .08, the Commonwealth may seek these instructions in order to establish that the motorist was impaired. With circumstance number two, if the Commonwealth satisfies this burden with prescription medication, the defendant can introduce testimony that there was never a warning that the medication may impair the ability to drive and that the motorist had no reason to believe the drug would have adverse side effects impacting the ability to drive. Client charged with OUI Drugs and reckless operation of a motor vehicle. Client alleged to have been driving under the influence after causing a serious accident. After motions were heard and several conferences with the prosecutor, the OUI drugs CHARGE WAS DISMISSED and the client accepted a plea to the reckless operation charge. If the defendant ends up suffering intoxicating effects from the prescribed medication, even though it was used as directed. An expert witness can be used to attest to the effects of the drug when mixed with alcohol and how these effects may have caused the unanticipated level of intoxication. The defense can show that the defendant did not know that the drug would have the ability to impair them in this way. However, this defense cannot be used in instances where the defendant was made aware of the effects of mixing alcohol with the drug. If the medications had clear, written warnings stating that they should not be taken with alcohol or the doctor who prescribed them advised the patient not to drink alcohol when taking them- it is assumed that the defendant drank alcohol despite knowing the risk. If you have questions about the content on this page or about an OUI charge in Massachusetts, you can call me directly at 781-686-5924. As a Massachusetts OUI Lawyer, it is possible to object to the admission of statements regarding medication. In many cases, the person may admit to taking medication, but not to a specific day or time of consumption. Merely because a motorist has medication in their possession, should not result in this type of evidence being admitted at trial. You can read more about the charge of OUI drugs and the court process when you face criminal charges by visiting our website today.